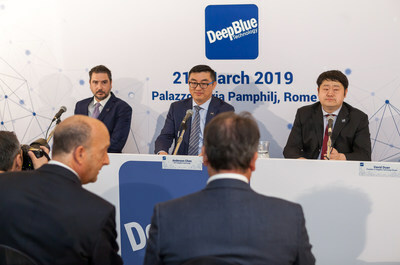 ROME, March 27, 2019 /PRNewswire/ -- On 21st March 2019, DeepBlue Technology, a leading AI company, has inked an agreement with the Fondazione Magna Grecia to create DeepBlue Italy and accelerate the digital transformation of Italian cities through Artificial Intelligence (AI) technology. This agreement will see DeepBlue Italy become an important asset in Italy's push to become an AI focal point, as detailed in the white paper 'AI at the service of citizens' authored by the Agency for Digital Italy (AGID) in March 2018. The company will supply much needed product development expertise and AI implementation into city infrastructure through the AI CITY framework. Hon. Antonino Foti, President of the Fondazione Magna Grecia said, "DeepBlue's products have a proven track record of reliability and complies with all European privacy requirements. We are excited to work with them to bring an AI-enabled future to our networks and cities." He continued, "we look forward to working with DeepBlue Italy to offer products based on big data, data analytics, and AI, to enhance option in the Italian market. In order to improve the efficiency in our cities, it will take a team of government officials, private enterprises, and the community to bring this vision to reality." Fondazione Magna Grecia brings to the table local knowledge, an extensive network of partners and resources that can accelerate this process. DeepBlue Italy will be led by Mr Fredrik Meloni, Director of DeepBlue Italy and other local hires with deep expertise and experience in the technology and civil service industries. Anderson Chen, Chairman of the Board of Directors of DeepBlue Italy, said, "Our products and frameworks have one goal in mind: to make use of AI R&D to enhance the everyday lives of our consumers all around the globe. This agreement is an important milestone because we share a common vision to see Italian consumers and cities embrace the AI revolution." DeepBlue Italy is a subsidiary of DeepBlue Technology, a leading AI firm headquartered in Shanghai, China. DeepBlue Italy will provide AI solutions and frameworks to cities and towns in Italy to accelerate the digital transformation of the country.